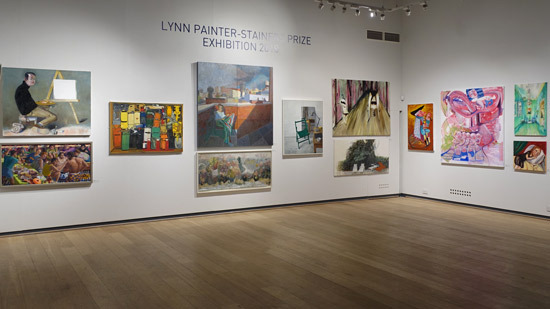 I went to see the Lynn Painter-Stainers Prize 2018 Exhibition at the Mall Galleries yesterday. 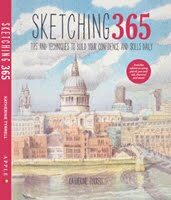 I always like it because of its emphasis on draughtsmanship which can sometimes be in short supply in other exhibitions. It's also an exhibition I've been visiting every year since its third year (in 2007) when Ben Sullivan won (Ben is last year's BP Portrait Award Winner). This year he selected artwork as a Judge along with Artist and Educator - Robin Mason - Head of Fine Art at the City & Guilds London Art School; Art Gallery Owner - Johnny Messum - Founder and Director of Messums, Wiltshire and Daphne Todd OBE PPRP NEAC - Past President of the Royal Society of Portrait Painters, BP Portrait Award winner in 2010 (and second prize winner in 1983) and latterly a television celebrity as a judge in the BBC's The Big Painting Challenge. So 2018 starts the second decade of visits to this exhibition! If you can't visit the Mall Galleries to see it you can view all the selected artworks online - in a rather curious slideshow. It got me reflecting on how the exhibition has changed. The most obvious change is the move from the Painter-Stainers' Hall in the City of London to the Mall Galleries. I decided in the end that I think it's because I maybe liked the art more in the earlier exhibitions - and you can see the artwork from 10 years ago in the 2008 exhibition in my post Lynn Painter-Stainers Prize 2008 and Exhibition (with others listed at the end of this post - all of which come with images of artwork in the exhibitions. A prime example of the fantasy present in the exhibition is the artwork which won the First Prize - which is both real and not real. I think it was the innovation in painting which won it the first prize - it certainly wasn't innovation in the subject matter (see below to see what I mean). For those two reasons it seemed to me that this exhibition has lost its way a little. I certainly liked it less than others I've viewed in the past. Maybe somebody forgot to advise the selection panel what the criteria for this exhibition actually is? 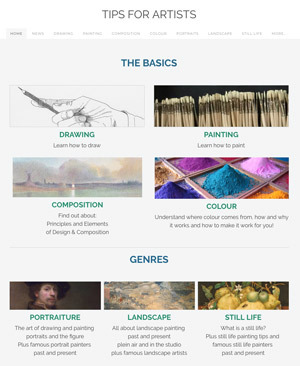 By design it has an open and unique remit that encourages and supports the submission of a wide, diverse and innovative range of the best of British contemporary representational painting and drawing. Well the Chairman is wrong. The skill of draughtsmanship seems to have well and truly bitten the dust! I wrote at the end of my catalogue WHERE ARE THE DRAWINGS? That for me is the biggest difference between those early exhibitions and more recent ones. I gather I am far from alone in having noted this omission. If drawings are not being submitted that is one thing. If the drawings are not good enough, then that's another. Creative representational painting also does not mean we leave reality behind and enter the realms of fantasy! Creative within this context should, in my opinion, relate to HOW reality is painted - while remaining firmly rooted in reality and NOT fantasy! 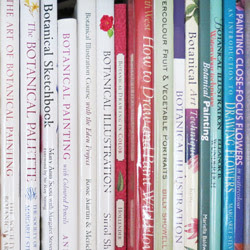 Representational painters typically act as observers and try to reproduce what they see. Their painting style is where any innovation or creativity should lie - but the object (not concept!) they represent should still be clearly self-evident. 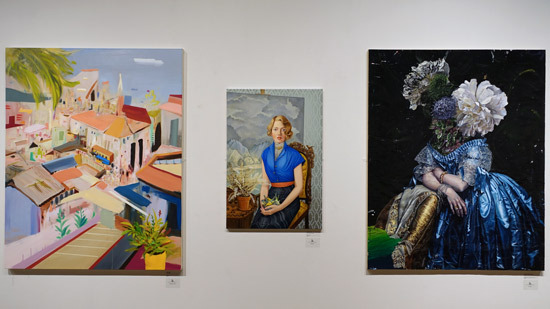 The Threadneedle Prize which also focuses on figurative and representational art has had similar wobbles in the past before returning to its original purpose. 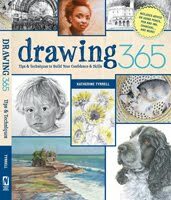 In the past the Prize championed art that was produced despite the fact that drawing was no longer taught in art schools. 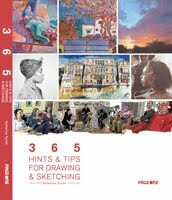 Now it celebrates the very significant number of works submitted by younger artists - presumably including those who have received no tuition in draughtsmanship. Frankly while the exhibition includes some very good works (e.g. see above) - and it was pleasing to see some perennial artists (including former winners - e.g. 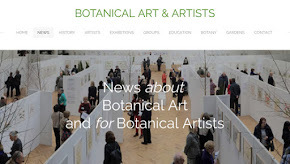 see above) - I personally would have edited some of the selected work out of the exhibition either because it veered outside of the scope of representational art or because it lacked good draughtsmanship. Finally, I'm sure I used to see more red dots at this exhibition in the past. 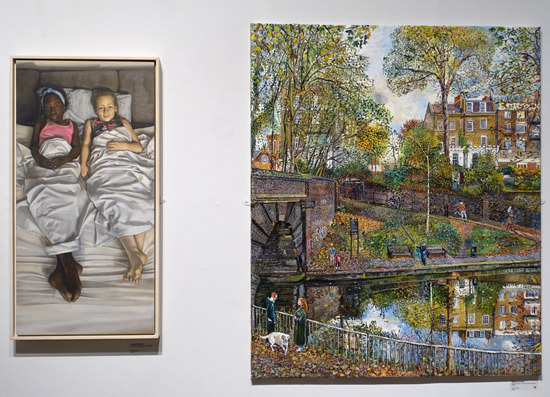 I used to recognise lots of the names because they were leading artists - as one would hopefully expect to see associated with the the best of contemporary representational painting and drawing. Now I'm not recognising most of the names - either from previous years of this exhibition or other prestigious competitions. If I'm right - and most are new to prestigious art competitions, this would explain some of the seriously silly prices - and why so very few have sold. In fact if I extract the two artists with a serious track record (one a previous winner who has a very strong following) the net total and value of sales to date - after the exhibition has been open for a week is just four paintings with a sale value of £4,045!! I shall be writing more about the need for a wake-up call on pricing in a future post. 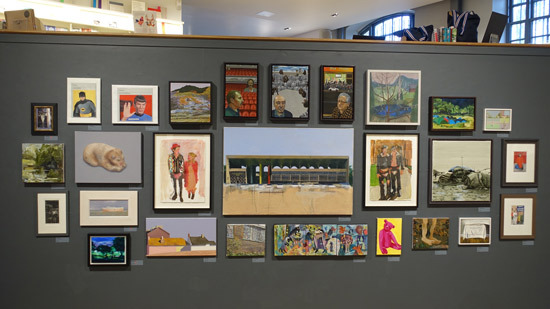 Smaller works on the wall below the mezzanine bookshop. 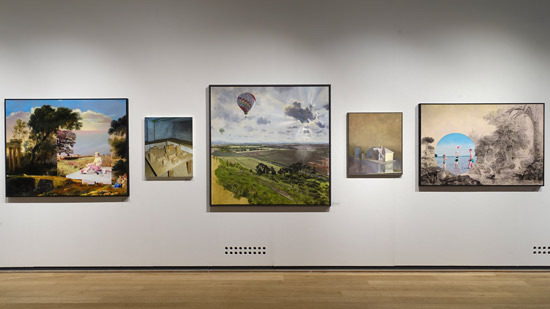 Bottom line - do I think this is an exhibition represented the best in representational painting in this country? No I very definitely did not. 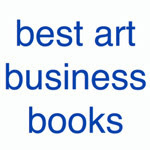 I'm very curious as to why so many established painters whose work I have enjoyed in the past have stopped submitting. Maybe they think it's drifted too far in the direction of "let's give the younger painter a chance". Personally I've absolutely nothing against competitions targeted at younger artists - and I think they have very important role to play in career development. the value of the prizes. For this information I had to go the website! Except the website was still announcing the winners of the 2017 exhibition and hasn't been updated...... Plus there's no Facebook Page for the Prize. There's low key - and then there's invisible! Part of the deal with artists when you run competitions is that you enhance their profile due to the publicity given to the competition. Seems as if the publicity budget has been cut! Pablo Castañeda Santana won the £15,000 Lynn Painter-Stainers Prize 2018 with his acrylic painting titled 'ELS' which is described as reinforced acrylic paint sheet mounted on panel (150cm x 120cm) £9,000. I'm guessing he won it for the technique he uses (see below). 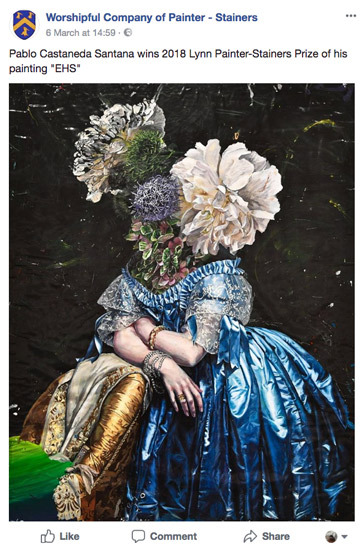 To me it reminded me of Madame Ingres meets Giuseppe Arcimboldo - or more specifically a riff on Jean-Auguste-Dominique Ingres's Portrait of Princesse Albert de Broglie, née Joséphine-Eléonore-Marie-Pauline de Galard de Brassac de Béarn. It will come as no surprise to the regular readers of this blog that my preference for First Prize winners is always a completely original work of art with no derivative features. I'm not clapping this one. In my view it breaches the rules. Santana was born and educated in Spain but now lives in London. This is a video of him talking about how he became an artist and also demonstrating how he made created his painting - which is very unusual. He paints using acrylic on glass and then peels it off. Born in Lancashire in 1978. Studied in London at the Slade School of Art, then at the Royal Academy Schools, graduating in 2004. Chloe Ong grew up in Singapore. 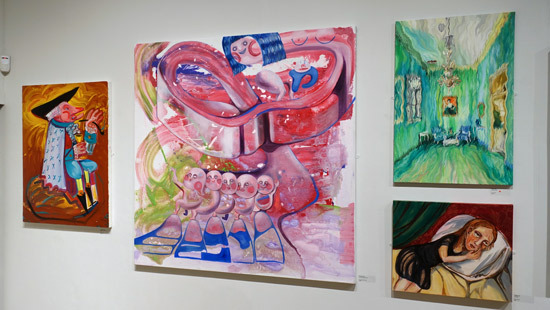 She came to study art in London and graduated with a First Class Honous Degree from the Slade School of Art last summer and is now pursuing a MFA at the Slade. He did his Foundation at Central St. Martins followed by a degree in Fine Art at Brighton University. 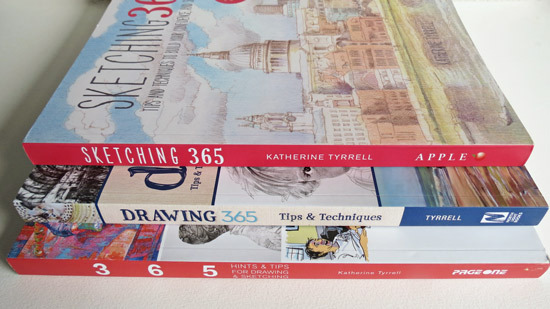 Thank you Katherine for your review, I went on the first day and found as you did little work that showed draughtsmanship, but a lot of fantastical work. Maybe that is the modern representational. 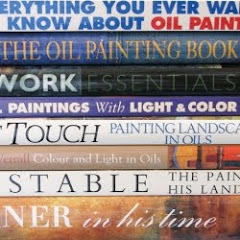 Personally it did not inspire me get my paints out , or want to purchase .